I feel so much better for getting that line out. I’ve lost a lot of sleep trying to come up with some cute play on words and now that it is out, I think I can get back to my 16-hour a day REM cycle. I want to let it be known that I didn’t contact Combat Jujitsu, they contacted me (more specifically a member contacted me). I don't want you to think I'm some kind of benevolent soul. Sometimes having no expectations is just as bad as having too high of expectations. I know that there is a difference between Japanese Jujitsu and BJJ, and the place wasn’t really on my radar. I don’t want to pretend like I was open minded. As if anyone has had that misconception at this point. One reason I do BJJ is because I don’t like getting punched in the face. Jujitsu guys are more than capable of punching me in the face. I am really only interested in the ground game, and I didn’t know what kind of ground game these guys had. Combat Jujitsu is in Minneapolis, but don’t let that fool you like it fooled me, we aren’t talking about downtown here, it is about a stone’s throw from Minneapolis-St.Paul airport, pretty much in Mendota Heights or Bloomington. So, let’s get to the ****ing point, right? We did some stand-up stuff for warm-up. That’s cool. Not my first rodeo. 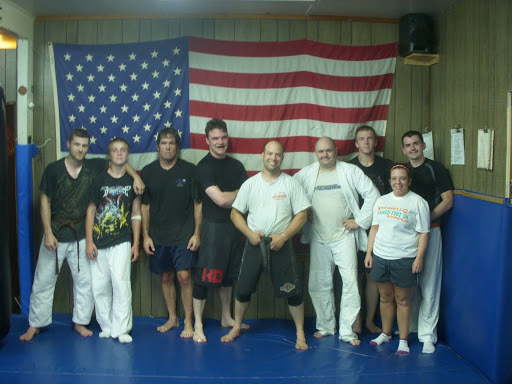 Then we did some ground stuff, lead by owner and head instructor, Japanese Jujitsu black belt Steve Peterson. Fine, cool. There were a couple of variations on things that I hadn’t seen before. But how well do they roll? Let me put it this way. In all the gyms that I have been to, I want to compete against these guys more than anyone else I have come across. Was I rolling at 100%? No, or course not. And, even though my ego would like to think that they were, I know full well that they had plenty of more tricks in their bag than what they showed on the mat. I went in with no expectations. It was just another gym. And frankly, it was another art altogether. What I got was a group of guys I would feel honored to compete against. Don’t let the name fool you. These guys can fight and these guys can roll. Just because you don’t see their school on the points leaderboard at Grappling Comps, doesn’t mean they don’t know how to **** your **** up. These guys have a tight game and are able to roll at a very high level. Don’t underestimate them. Or maybe you should. It might make tapping you out all the more satisfying. They welcomed me with respect and courtesy (more than I can say for my parents) and have earned my respect. In the end, don’t judge a place because of how they spell their art, or where it comes from; if you haven’t rolled on the mat with them, then shut the **** up. Besides, I’ve seen the **** you all post on facebook. You wouldn’t know what grammar was if it ****** you in the ***.